Dr Chahal and her office staff, from the front desk agent to the patient care technician, far exceeded my expectations. 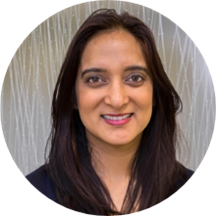 DrChahal is not only a kind person, but she is WICKEDLY intelligent and up to date with the best practices for managing patients with heart issues. Personally, her bedside manner is second to none, insuring I understood her explanations to give me peace of mind. I couldn't have been happier! Dr Chahal and her office staff, from the front desk agent to the patient care technician, far exceeded my expectations. Dr Chahal is not only a kind person, but she isWICKEDLY intelligent and up to date with the best practices for managing patients with heart issues. Personally, her bedside manner is second to none, insuring I understood her explanations to give me peace of mind. I couldn't have been happier! Dr. Harjit Chahal earned her medical degree from Government Medical College Amritsar. Dr. Chahal works at MedStar Health Cardiology Associates and is based in Washington, DC. She is an experienced cardiologist. Post completing her medical degree, she concluded her fellowship in cardiology and cardiovascular imaging from the Johns Hopkins Hospital. Additionally, Dr. Chahal obtained her master’s in public health from Johns Hopkins University. She has also pursued a residency in internal medicine at the University of Maryland, MedStar Union Memorial Hospital. Board certified by the American Board of Internal Medicine, Dr. Chahal has co – authored several publications. Dr. Chahal majorly focuses on preventive health care and treats patients in a structured manner, focusing not just on the ailment but also on the general well being of the patient. She is a compassionate practitioner, who believes in educating her patients about their health for long and short term benefits. Ability of Reduced Lung Function to Predict Development of Atrial Fibrillation in Persons Aged 45 to 84 Years (from the Multi-Ethnic Study of Atherosclerosis-Lung Study). Chahal H, Heckbert S, Barr RG, Bluemke D, Jain A, Habibi M, Alonso A, Kronmal R, Jacobs J, Lima JAC, Watson K, Liu K, Smith LJ, Greenland P. American Journal of Crdiology 2015 June 15. Heart Failure Risk Prediction in the Multi-Ethnic Study of Atherosclerosis. Chahal H, Bluemke D, Wu C, McClelland R, Liu K, Shea S, Burke G, Balfour P, Herrington D, Shi P, Post W, Olson J, Watson K, Folsom A, Lima JAC. Heart 2015 Jan 7. Transthyretic Cardiac Amyloidosis: and under-diagnosed cause of heart failure. Molina G, Judge D, Campbell W, Chahal H, Mugmon M. J Community Hosp Intern Med Perspect Epub 2014 Nov 25. Seriously the best medical experiences are with Dr. Chahal, shes very clear personable, quick, and pleasant. I enjoyed meeting Dr. Chahal. She listened, was personable, explained tests and possible results as well as types of treatment options, and indicated when I would hear from her and how long test results take. She even made me laugh. Thenurse/technician was less personable but efficient, and the front desk staff were friendly and efficient. I really like Dr. Chahal. This is the second appt I have had with her. I even had a procedure done at Washington Hospital Center after my first appt with her, and she came to check on me before I wentunder. She explains things in depth so you can understand what's going on, and isn't quick to push you to make decisions right away. I recommend, hands down..
Dr Chahal was very professional during my first visit to discuss my cardio-logical situation. She impressed me with her intellect and medical knowledge. She also was interested in my case to the point that she wanted me to understand my medicalproblems as well as the best ways to improve my health. She spoke in clear, simple terms and welcomed my questions and feedback. She was positive and optimistic more like an athletic coach than a high school principal scolding me for my poor lifestyle habits. I welcome that and look forward to being her patient.